Ó Murchú immediately began researching the provenance of the tapes. From 1935 to 1971 the Irish Folklore Commission (Coimisiún Béaloideasa Éireann) sent recording units around Ireland to document speech and music. Notable collectors included Séamus Ennis, Alan Lomax and Robyn Roberts. Ó Murchú discovered that the Commission recorded Pádraig playing with friends Dáithí Ó Cinnéide and Eamon Breathnach sometime during autumn 1952. The results were considered too eccentric for broadcast and the tapes languished in the archive of the Commission until they were discovered by Ó Murchú over half a century later. 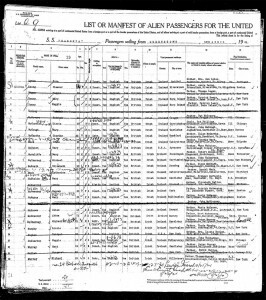 Further research unearthed the immigration records of Pádraig’s parents, Maggie Leary and Michael Murray (lines 5 and 30 in the ship’s manifest shown here). 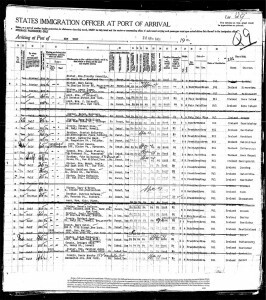 Both from Cork, Maggie and Michael immigrated to New York in 1921. 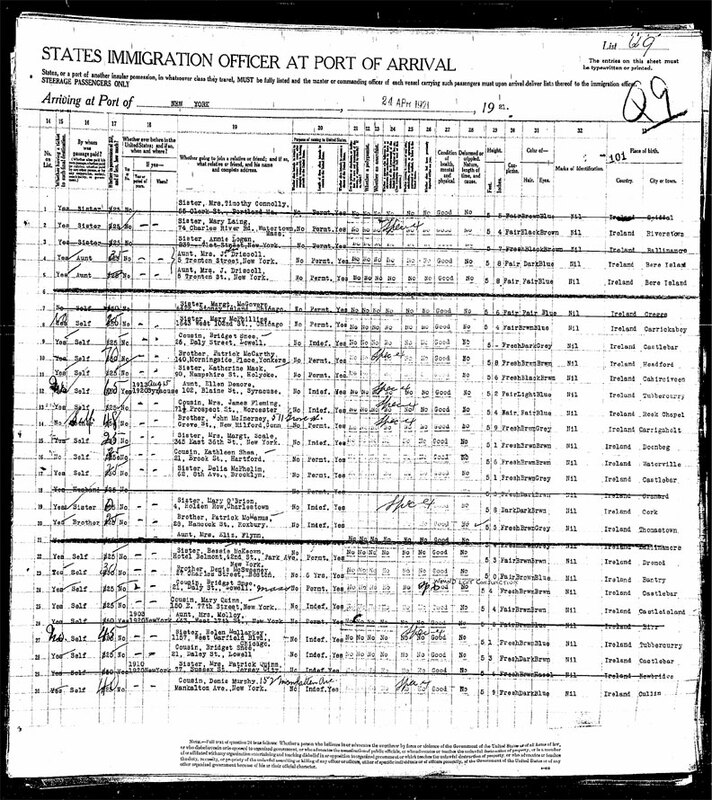 They were married in New York in 1923, and the following year Maggie gave birth to their first and only child Pádraig. 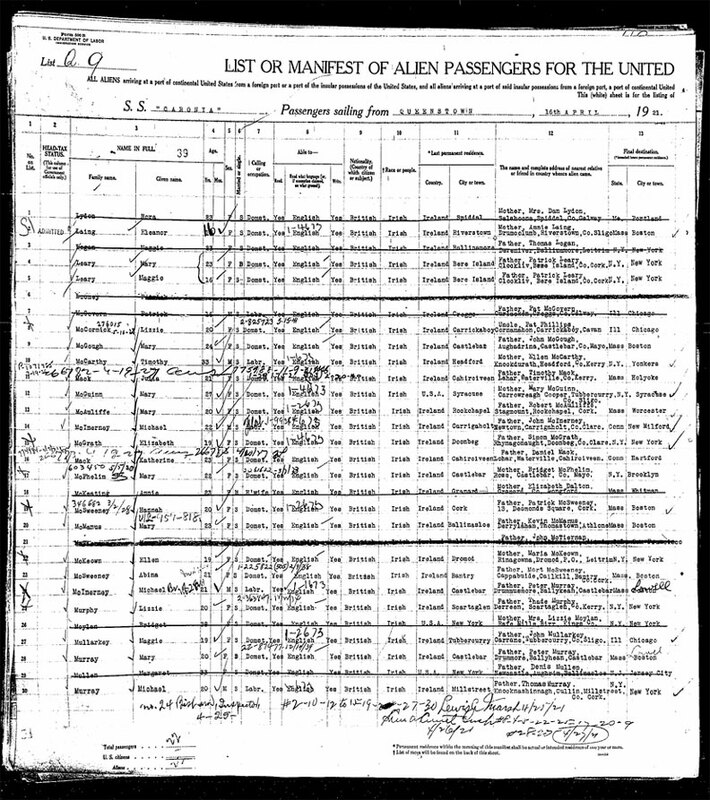 After Michael’s death from tuberculosis in 1950, Maggie and Pádraig returned to Ireland, living in Cork until they passed away in 1978 and 1992 respectively. Michael was a gifted folk musician, his primary instrument being the uileann pipes, an instrument which he taught his son to play. Michael’s death affected Pádraig very deeply, and he never played the pipes after the passing of his father. The structure of the pipes seemed to be in his blood, however, most significantly the instrument’s focus on fixed drones. 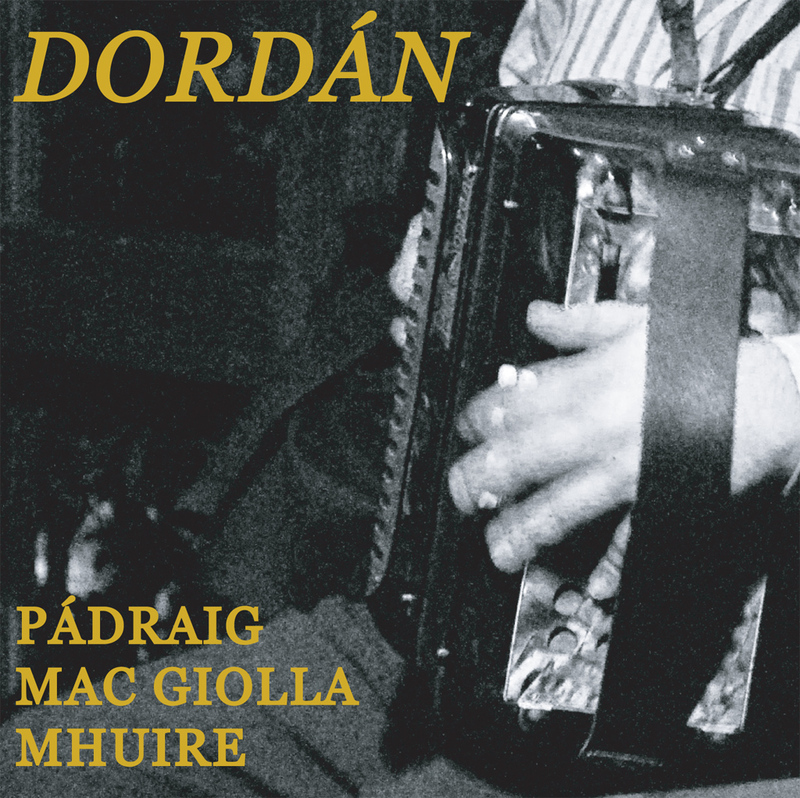 DORDÁN: Pádraig Mac Giolla Mhuire will be released by Radio Telefís Éireann on CD in 2015. RTÉ have supplied the printer’s proof of the CD cover and excerpts from several different tracks. Dordán excerpt 1 (1952) by Pádraig Mac Giolla Mhuire, Dáithí Ó Cinnéide and Eamon Breathnach. Dordán excerpt 2 (1952) by Pádraig Mac Giolla Mhuire, Dáithí Ó Cinnéide and Eamon Breathnach. Dordán excerpt 3 (1952) by Pádraig Mac Giolla Mhuire, Dáithí Ó Cinnéide and Eamon Breathnach. Dordán excerpt 4 (1952) by Pádraig Mac Giolla Mhuire, Dáithí Ó Cinnéide and Eamon Breathnach. This entry was posted in Drone, Improvisation, The West, Traditional Music. Bookmark the permalink.